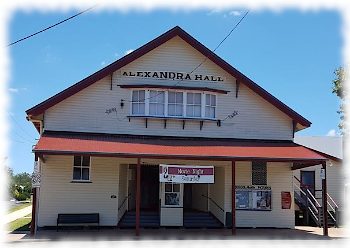 Every Saturday night and third Friday, Alexandra Hall brings a current hot movie home to a 1960s setting: remember the hessian sack seats, tasty hotdogs, cinema-grade hot popcorn, hot milos, teas and gourmet coffees, lollies, chockies (yes - maltesers!) and icecreams - even an intermission to re-stock! Our old-fashioned Country Hospitality extends to the prices: child (primary / high school) $6, adults $8, family $25. Contact us for more information about Toogoolawah's "olden days" movie theatre experience and the latest movie schedule!